DC Comics is having what you may call an identity crisis (pun intended). They've been going through some creative quandaries and workplace issues that haven't really done them any favors. In an attempt to right the ship though they're launching their latest universe-spanning reboot in Rebirth. 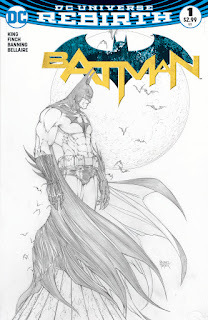 And Aspen Comics is offering a couple exclusive covers--starting with Batman #1 on June 15. These new exclusive DC Comics Rebirth covers continue an illustrious collaborative history between the two publishers, including 2004’s Superman: Godfall mini-series presented by Aspen, Michael Turner’s best-selling “Return of Supergirl” six-issue run within the pages of Superman/Batman, a run of covers on The Justice League of America and The Flash. 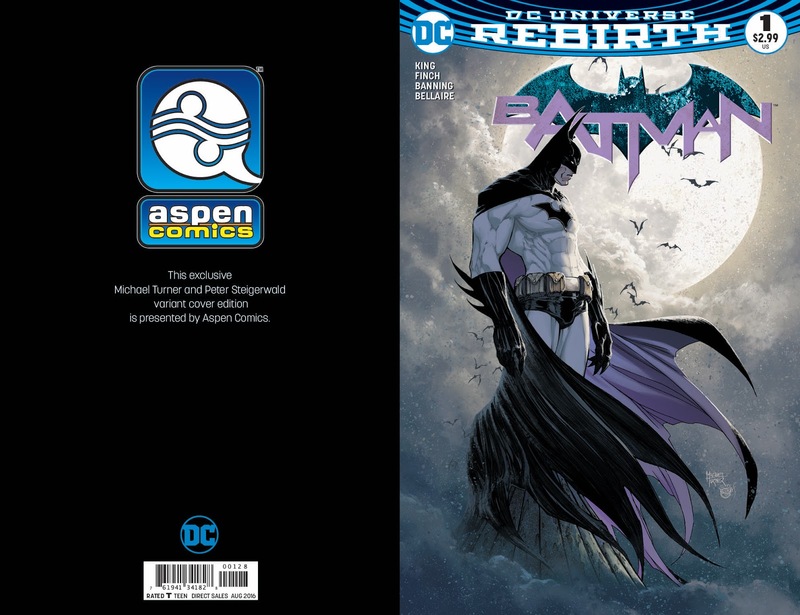 The series of Aspen Comics exclusive covers begins with DC’s Batman #1 on June 15th and is only available on www.AspenStore.com. Pre-orders for this special variant will begin on on June 1st, featuring a cover by late Aspen founder and legendary artist, Michael Turner with colors by The Dark Knight Returns: The Last Crusade colorist Peter Steigerwald, limited to 3,000 copies, with a special black-and-white sketch cover edition limited to 1,500 copies. 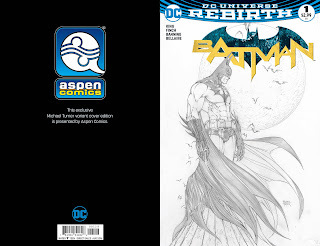 Aspen also plans to make limited quantities of DC’s Batman #1 available for purchase beginning this June at Denver Comic Con on June 17-19th and Comic Con International: San Diego on July 21-24th exclusively at the Aspen Comics Booths. Aspen Comics is pleased to announce a unique partnership with DC Comics for a run of co-branded AspenStore.com exclusive DC Comics variant covers featuring both publishers’ signature cover dressing, beginning with DC’s Batman #1 on June 15th, and more co-branded covers to be revealed soon. These new AspenStore.com exclusive DC Comics Rebirth covers continue an illustrious collaborative history between the two publishers, including 2004’s Superman: Godfall mini-series presented by Aspen, Michael Turner’s best-selling “Return of Supergirl” six-issue run within the pages of Superman/Batman, a run of covers on The Justice League of America and The Flash, an Eisner-nominated run of covers on DC’s critically-acclaimed Identity Crisis mini-series and many others. 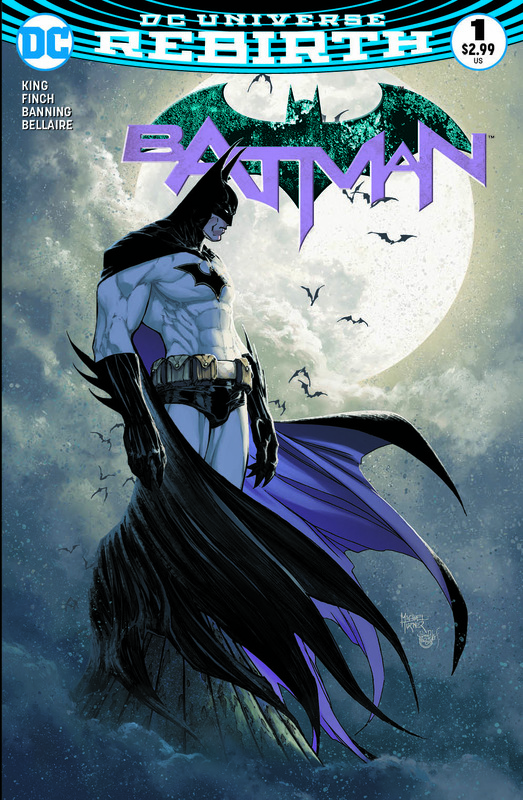 The series of Aspen Comics exclusive covers begins with DC’s Batman #1 on June 15th and is only available on www.AspenStore.com. Pre-orders for this special variant will begin on AspenStore on June 1st, featuring a cover by late Aspen founder and legendary artist, Michael Turner with colors by The Dark Knight Returns: The Last Crusade superstar colorist Peter Steigerwald, limited to 3,000 copies, with a special black-and-white sketch cover edition limited to 1,500 copies. 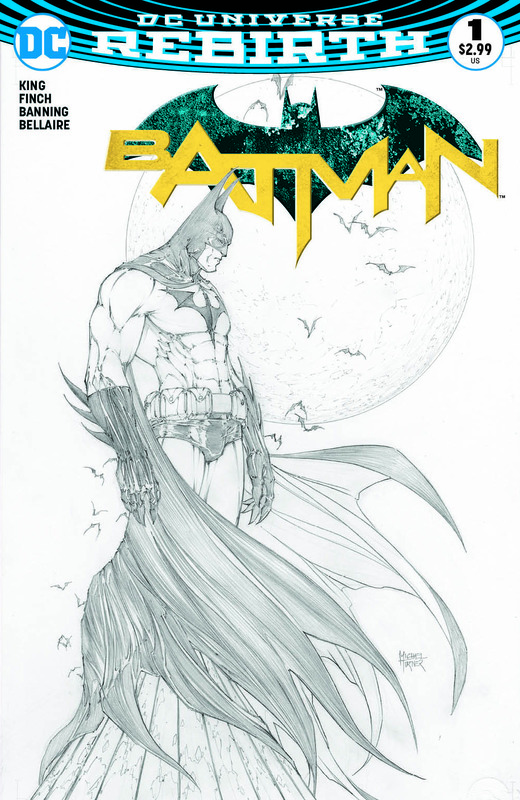 Aspen also plans to make limited quantities of DC’s Batman #1 available for purchase beginning this June at Denver Comic Con on June 17-19th and Comic Con International: San Diego on July 21-24th exclusively at the Aspen Comics Booths. 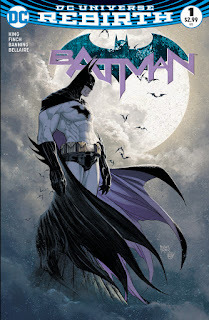 To purchase the Batman #1 Aspen Comics exclusive variant online please visit www.AspenStore.com.